The Hotel Holiday is situated in a quiet place, 8 minutes’ walk from Zermatt’s center and only 220 yards from the Sunnegga Express, taking you to the Sunnegga, Blauherd and Rothorn mountains. 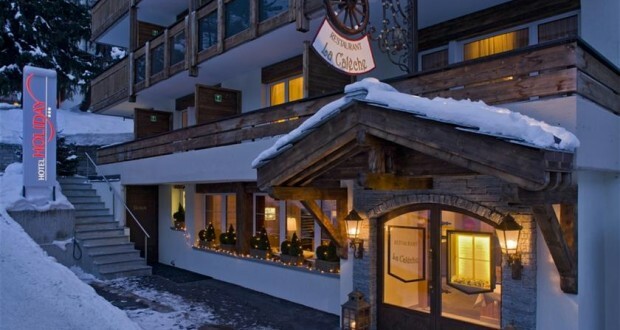 The ski slope from the Sunnegga down to Zermatt brings you right to the Holiday hotel. The Gornergrat train station and the bus stop to the Klein Matterhorn are as well easily reachable by foot. The Holiday hotel offers nicely furnished rooms with balconies with elevator access and superb views of the surrounding mountains. Your host, Denis Matray, an ex-student of the famous chef Paul Bocuse, creates culinary delights of the international and regional cuisine. You can enjoy your meal with a fine wine from the large cellar. A generous buffet breakfast is served every morning.